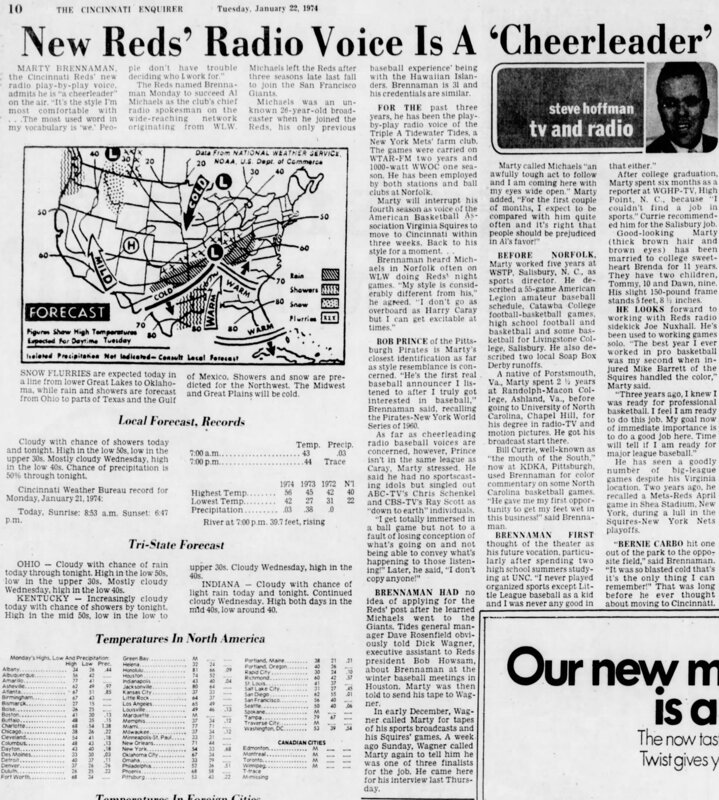 In 1974, the Cincinnati Reds hired Marty Brennaman as their new radio broadcaster. Below is an excerpt from “The Big 50: The Men and Moments That Made the Cincinnati Reds.” It describes Brennaman’s early days with the club. In the process of researching the book, Chris Garber and I dove deep into newspaper archives. This piece from the Enquirer, in which Marty was described as a “cheerleader,” was a delightful find. One of my favorite chapters in the book was the one titled “Marty & Joe.” Here’s how we described Marty’s introduction to Cincinnati. Early in 1974, Marty Brennaman traveled up I-75 from Cincinnati to meet the Reds off-season media caravan in Dayton. 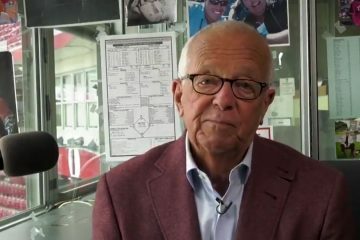 A 31-year-old Virginian, Brennaman had been doing play-by-play for ABA basketball and minor league baseball games when he was hired by the Cincinnati Reds to join their radio booth. One of his first duties in Dayton was to have publicity stills taken at a local photo studio. As he opened the door, he saw Joe Nuxhall sitting there. After a fine career as a Reds player, Nuxhall had joined the Reds’ broadcast team in 1967 and he was eager to meet the latest young play-by-play guy who would be his broadcast partner — the fifth different partner in eight years. Marty thrust out a hand in Joe’s direction. “I have your baseball card,” Marty said. And thus, a legendary partnership was born. “From that moment on, we developed a one-of-a-kind relationship,” Marty said. That bond would be cemented a month later, when the pair began broadcasting games from spring training in Florida. Brennaman was taking the place of the very popular Al Michaels, who had moved on to the San Francisco Giants’ radio booth. Marty would later admit that he was feeling the pressure. 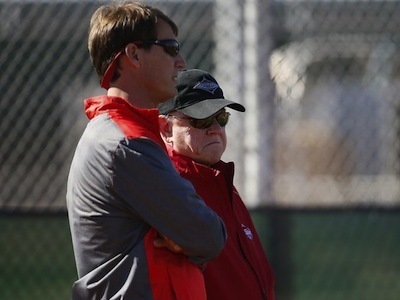 The first spring game went well; Brennaman gained confidence, and he and Nuxhall seemed to work well together. The second game was at Al Lopez Field in Tampa. As they went on the air, Brennaman opened the broadcast by welcoming listeners to “Al Michaels Field.” He recognized his Freudian slip immediately, and looking to his right, he could Nuxhall convulsing with laughter — the old lefthander nearly fell out of his chair. A few weeks later, in the first inning of Marty and Joe’s first regular season game (Opening Day 1974), Brennaman called Hank Aaron’s record-tying 714th career home run. At the next commercial break, Nuxhall turned to his young partner. “What the hell do you do for an encore after that?” he asked. Marty had quite a few encores after that auspicious beginning, eh? He will be missed. Was it in year 3 or 4. And I don’t remember what he’d say before that. Second game of 1974 vs Braves. First game was Hnak Aaron’s HR #714. Obviously, I would never have guessed that. He must have been working on that in the offseason beforehand, rather than just an off-the-cuff, “and this one belongs to the reds”. And then he thinks to himself, hey that ain’t bad. Another phrase he started using at some point was “Titanic Struggle”. I can’t recall any other phrases he used regularly. I loved Marty’s pregame show with Sparky Anderson called “The Main Spark”. Yea ! “The Main Spark”. I forgot about that one. I had to always listen when I was a kid, really enjoyed that. Marty is great – a true HOFer. Nuxhall was obviously not as good a broadcaster (not a slight – nobody not named “Scully” was). But I wonder if Marty would have been nearly as good without Joe. If I have any complaint about Marty, it is that sometimes he can get a little too negative/mean/salty. Nuxhall was a nice counterbalance to that; I think Nuxhall’s humility and humanity helped Marty be a better person and broadcaster. Agreed as a team, they really complimented each other and were a pure joy to listen to. It was fabulous that at the time they were broadcasting together there were so many great Reds Teams. And of course they were on WLW and back then, I think it was the only station in America that had no other station on it’s same frequency. That is 700am. Therefore they could be heard in the evenings to a vast majority of the country. But, I know as we get older we often tend to get a little negative and salty compared to our younger years. I think that is why Dana Carvey’s “Grumpy Old” Sketches from Saturday Night Live were so funny. Because the truth is often funny.